… offers our unique patented meth-od of preserving your favorite photograph in a frame guaranteed to be impervious to the elements! Day & Birthday's. Serves as a intriguing focus point on your Mantle...Curio Cabinet, Knick Knack shelves..
… captures your keepsake photo on a fine ceramic plaque beneath a clear, porcelainized surface that preserves the colors – forever! Porcelain Encased in 14kt Gold or Sterling Silver! 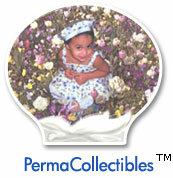 … featuring a true to life porcelainized portrait of the person's dearest to you. Guaranteed never to fade, to be worn and treasured always! 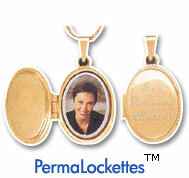 Whether placed on a stone monument, bronze tablet, mausoleum niche or cremation urn, PermaFrame and PermaPorcelain lifelike images heighten memories and acquaint children with departed family members … when visiting the interment site. And either product is the ideal way to commemorate that wonderful and loyal Pet!